Fill out the form below and one of our service technicians will contact you to set up an appointment. Don't take the risk of a fire, call us today! 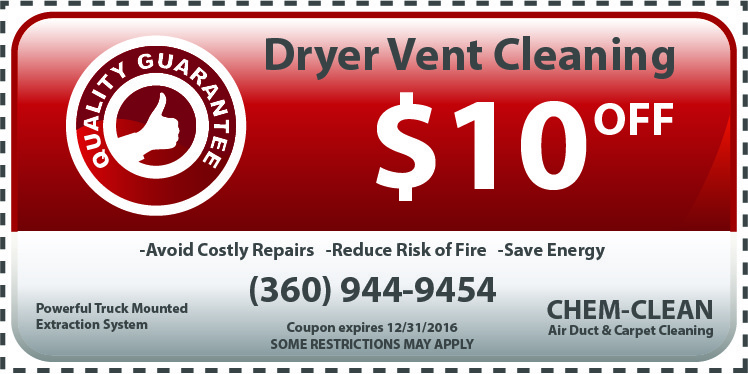 When you call Dryer Vent Guys we'll do our very best to accommodate your schedule. We love serving our customers and your experience is #1. We love our clients and buy the time we're done we hope you'll feel the same. We pride ourselves on doing the job right the first time. We've got you covered with multiple types of payment options. We believe that paying for your service should be quick and easy. $10 off money saving coupon! Print out the coupon* and show it to us at the time of payment and we'll take $10 off your residential property. *Restrictions may apply. Ask service tech for details. Our simple, no fuss dryer vent cleaning for one single unit residential property. Call and tell us about your multi-unit buildings and we'll come and give you a quote. We've been serving the greater Portland/Vancouver metro area for over 20 years. When we're not servicing your dryer vent we are busy cleaning and restoring carpets. We also provide the best and highest performing carpet cleaning in town. Our truck mounted cleaning system is so powerful it leaves your carpets to dry in no time at all. Our friendly, non-smoking and clean staff are here and ready to help. We can perform one-time maintenance or set you up on a schedule for hassle free convenience.